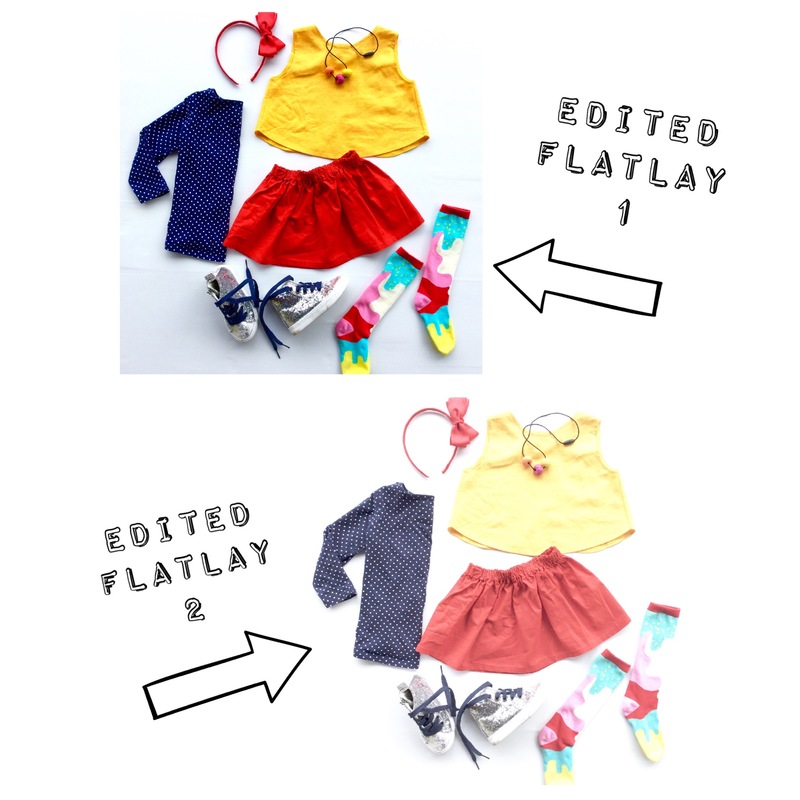 Top Ten Tips for Eye-Catching, Gorgeous Flatlays Everytime! Heeey! So you wanna improve your flatlay game? It’s fun, and addictive! I love to style a good flatlay, and I’ve come up with my TOP TEN TIPS to help you out! Note – this is not the high tech version, cos I’m not a high tech person! ? ?But hopefully it will still,be a huge help! ?? Decide on your focal point! When you’re starting out, make just ONE item your feature! Then build the flatlay around it. Don’t add items that will overshadow your big ticket item! You can always break this rule later (I often do!) but you’ve gotta understand the rules to break ’em! Tada! Gorgeous Little Lords red cardi as the focal point!?? Don’t overcrowd your picture! Whether you’re shooting a real flatlay or composing one on an app, you want enough detail for interest, but not so much your don’t know what you’re looking at! When you’re taking photos, make sure you don’t zoom in too close – it makes it harder for people to see and appreciate your full flatlay! When shooting photos, find a place with perfect lighting and stick with it – take photos at the same time, and in the same location, for great results! You want indirect but good strong natural lighting – think near a window or door, or outside on a patio. My perfect flatlaying spot is on my front patio, between 10am – 1pm, around about! Dont be afraid to edit your photos, but DON’T over edit them!! There are lots of editing programs out there, including snap seed and picmonkey. I mostly use just the apply photo app editing tools! I find once you take a good shot you shouldn’t need to spend hours editing to make it look amazing, My favourite areas to adjust are exposure, brightening, contrast and saturation. BUT I like to edit the first photo quickly while in front of the real flatlay – so I can compare back. If it doesn’t look real and the colours aren’t the same, dump it and start again! Sometimes all the editing in the world can’t correct bad lighting and grainy photos – and it’s better to try taking some new shots again later. Okay, so Edited Flatlay 1 may not have perfect white in the background, but the colours are true to the original products and are vivid and look great (I think! ?). Edited Flatlay 2 has the brightness and exposure dialled up too much – the white is perfect but the actual products are too pale and indistinct – NOT what you want! Don’t forget about your background! White is a great starter – I love using white board or corflute sheets available from Bunnings for less than $10. BUT don’t feel like you have to stay with white – especially when creating a flatlay in an app – get adventurous and play with colour and texture. I use coloured cardboard sheets from the hobby shop as a background too! Think about what will complement the products in your flatlay and match the vibe! When making flatlays in an app, my fave one to work with is PICCOLLAGE (the flatlay below was made with it!)! Be adventurous! Play with different combinations and colour clashes, and don’t forget a flatlay does not have to be a complete outfit – it is outfit inspiration, so there can be double ups or items missing from an outfit, as long as it inspires a certain look! Find an app that is easy to use – I like to use pic collage for all my flatlays, so I can clip backgrounds out and easily place items. I’ve also heard polyvore is popular for flat laying. Ask around to see what others use – I’d love to know what you use! Don’t be afraid to try a few different combinations of products – if it doesn’t look quite right, move them around! Take something out, try a different angle. If you’re taking photos, sometimes I take at least 20 and it’s the very last one I love the most! Often taking a photo and looking at it will tell you what you need to change. I think I moved these products around at least 15 times before I got this combination. Just keep shifting and framing them in a shot til it works! Balanced, but not too symmetrical! When posting on social media, don’t forget to tag each store or maker in your photo, to acknowledge the use of their product or photo. If you’re unsure, check with them first! I hope my TOP TEN TIPS were a bit of help – of course there’s plenty more I could share, but these will get you off to a good start! Got any questions, or wanna share another tip of your own? Comment below, or email me at hello@kablooiestore.com.au . I’d LOVE to hear from you! ? I hope these flatlays get you hungry for some fun food themed style!! ? As always, click the links below the flatlays and you’ll head straight to the source of all these products. It’s definitely worth checking out some of these – many are from micro handmade businesses who are rocking their style. ?? Have fun, and don’t forget to EAT YOUR GREENS! 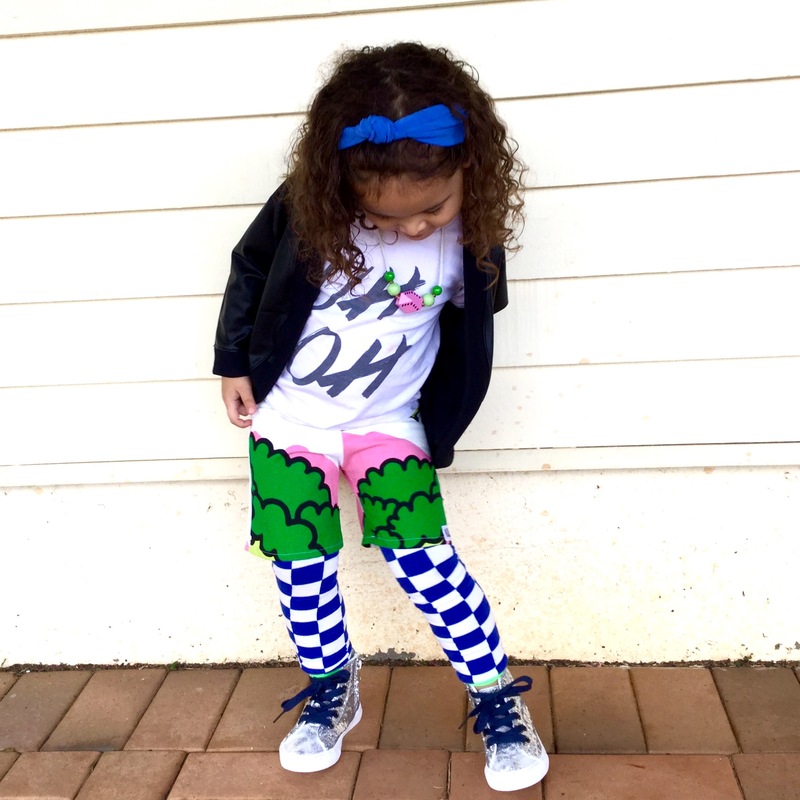 I’m crushing on Hey Jude Kids sweater tees right now – so many rad prints! Check these out! 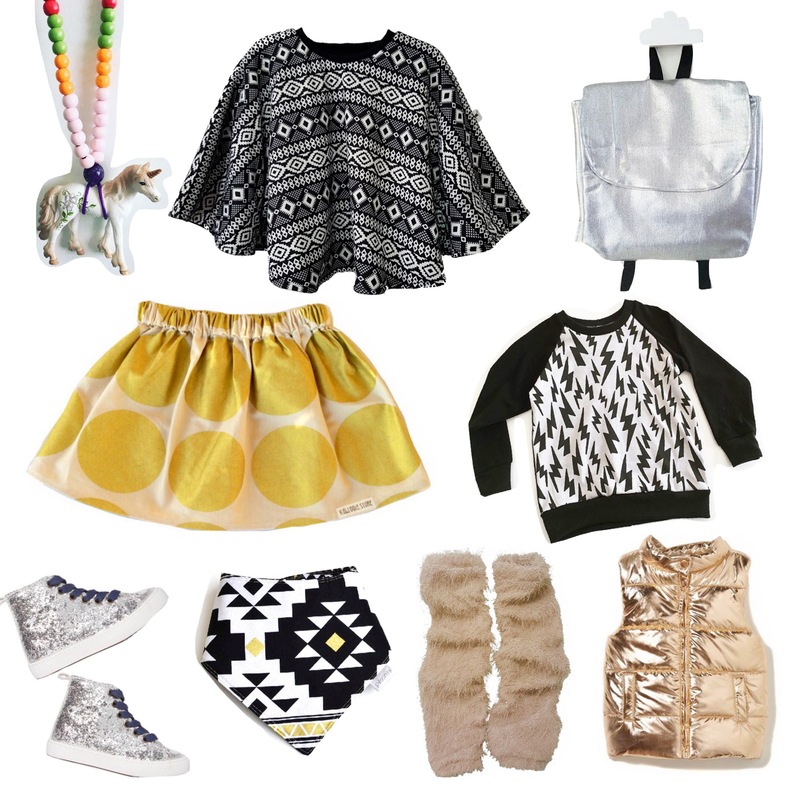 Wanna add a little bit of sparkle to your wardrobe? Check this one out! Wanna have a go at a food themed flatlay yourself? I’ll be having some fun on Instagram soon with food themed flatlays – come get your flatlay on and join us! ??????????????? 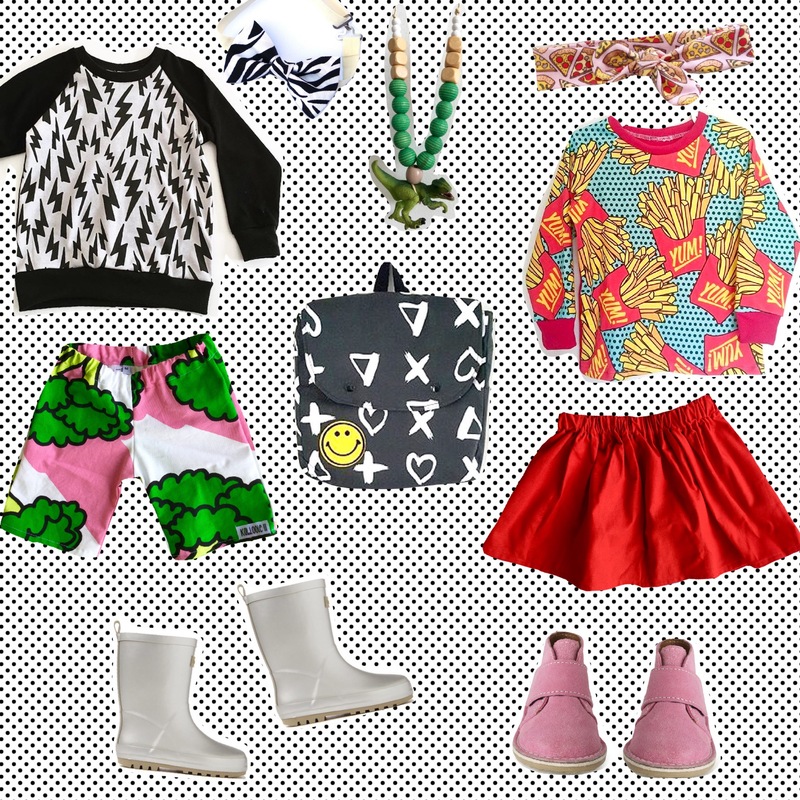 Welcome back to PART 2 of the Kablooie winter style guide for kids – settle back and enjoy the ride! 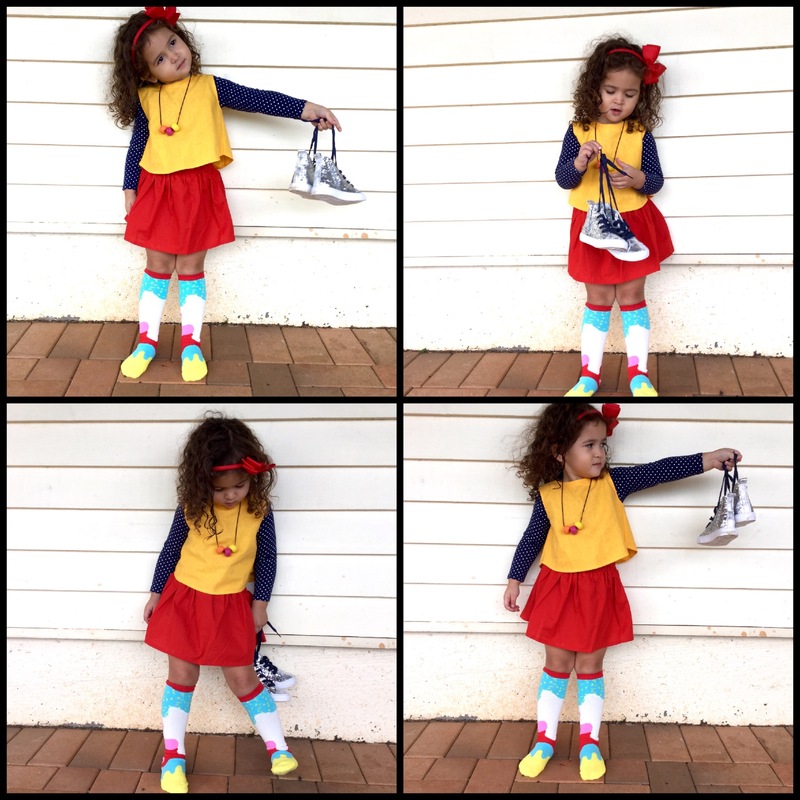 This week I’m making BLOCK COLOURS the star of the show – and I can’t believe how many amazing products I have to play with here – so much talent in the kids fashion arena. ?? To start off we have …. SAY IT WITH RED! Theres nothing like a statement colour offset by monochrome to really stand out…. 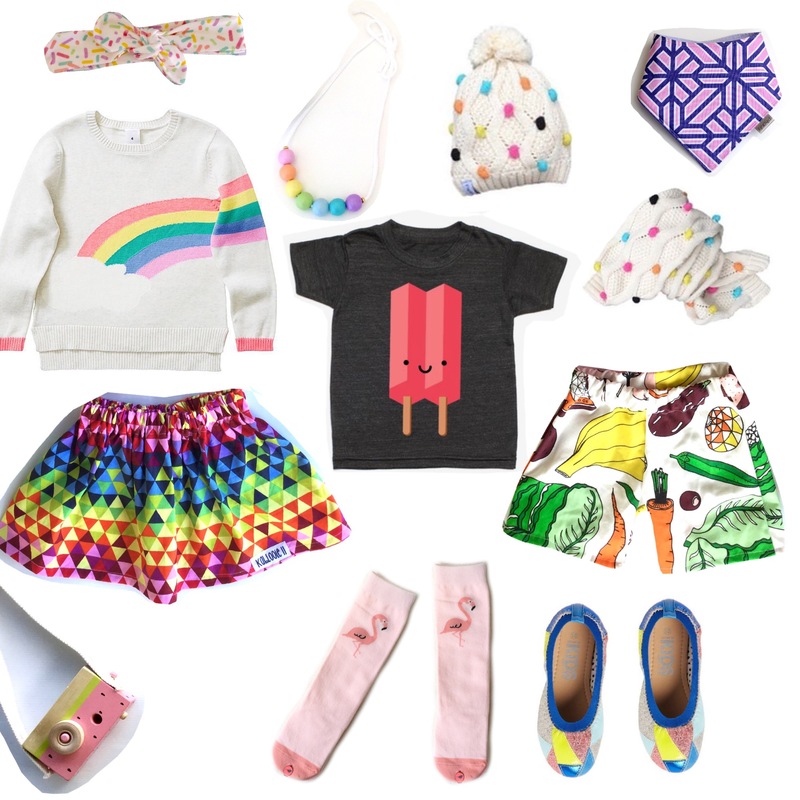 We also had a chance this week to road test some stunning products including some gorgeous MayaMe designs tops, and Ice Cream melt socks from Just Ray Baby. ??? I’d also love to share some snaps from my gorgeous Brand Ambassadors – who are absolutely crushing the colour layering look for winter!! ???? You can see more of their shots on their Instagram accounts – just click the links to go straight there! ?STYLE ?So what are the cool kids wearing this winter? Everything!! They’re not following trends, they’re setting them! Funky pattern and colour mixing, layering to the MAX, and mashups of popular styles is their jam. ??? 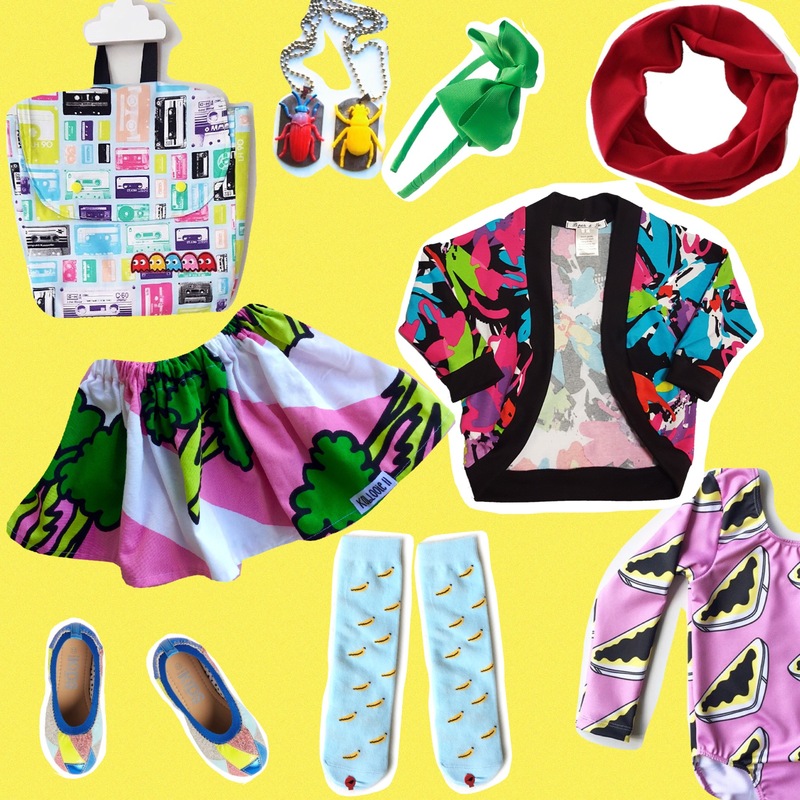 Over the top, bold and quirky, with the perfect mix of staple pieces and small micro labels! Kablooie is kicking off winter in style with a mini series of FOUR winter style guides. A mix of themed mood boards, flatlays and real outfit shots – an eclectic mix of style, colour and fun! COLOUR CRUSH! Go completely overboard with colour! ??? GLITTER BOMB OF GLORY! ✨✨✨ Every funky sparkle you can imagine! Did I ever say Kablooie shorts are just for boys? No way Jose! 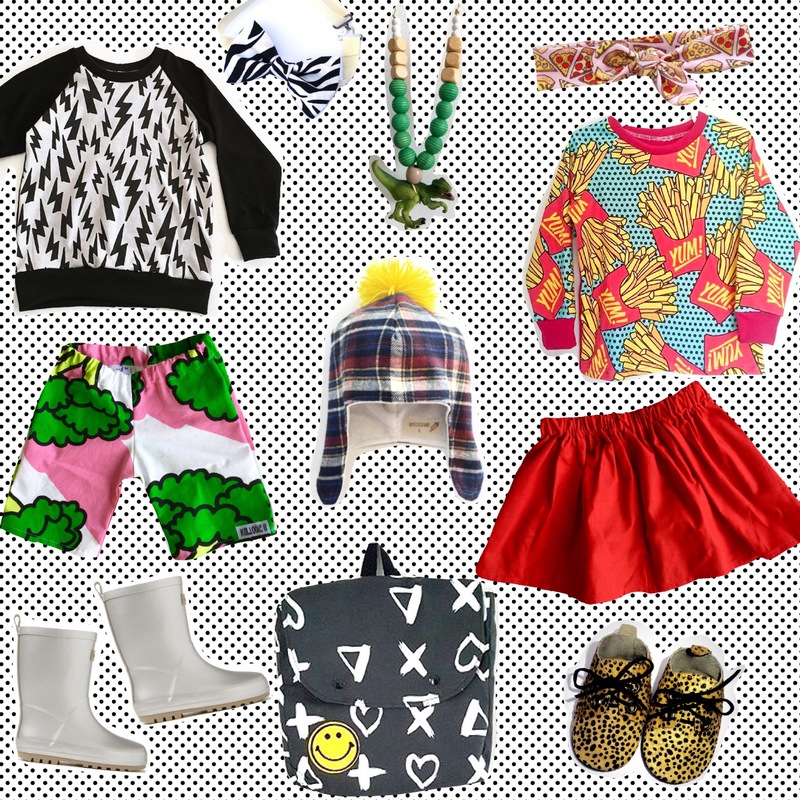 How funky are some statement shorts layered with vibrant tights, fun tees and some awesome headgear? Yes please!! LETS GET SHORTY!! 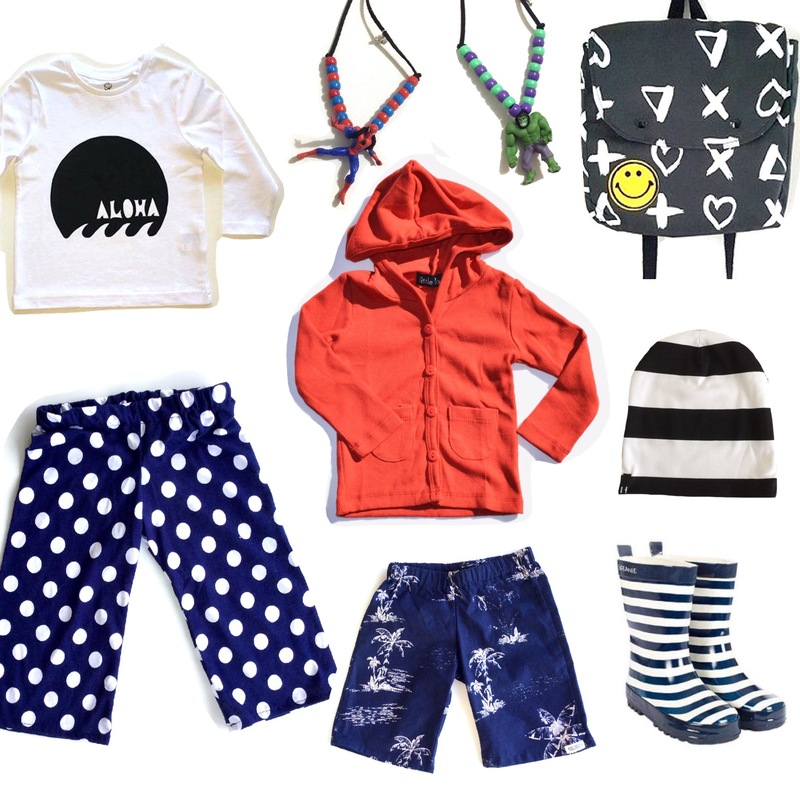 Layer it up – go crazy with the pattern combinations! ?? The VEGORAMA Shorts Colour Blast! I don’t think even I could fit more colour into this outfit!! ???? Love what you see? Share the love!! Forward to a friend, or share on your Facebook, Twitter or Instagram accounts. I’d love to see what your favourite outfit is! 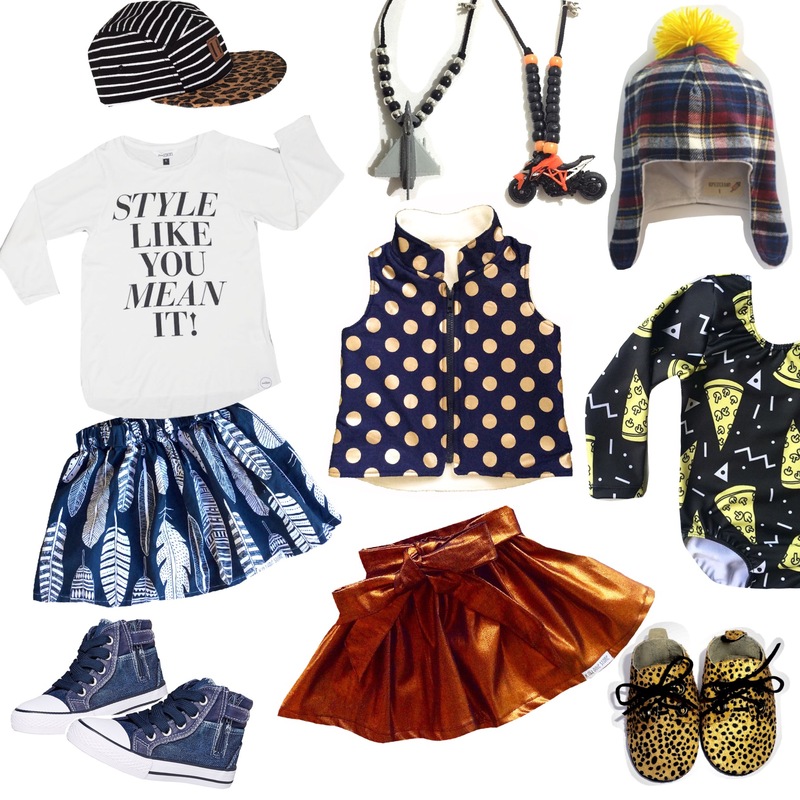 Goodbye drab winter outfits – hellooooo mini trend setters!! Stay tuned for the next mini style guide, coming out next Friday! [Do you have a friend who’d love this? Feel free to forward it to them! ] ?? Alexandra Yount – Teen Sewer Extraordinaire! How cool is that for a title?! And that’s exactly who this week’s blog interview is with! 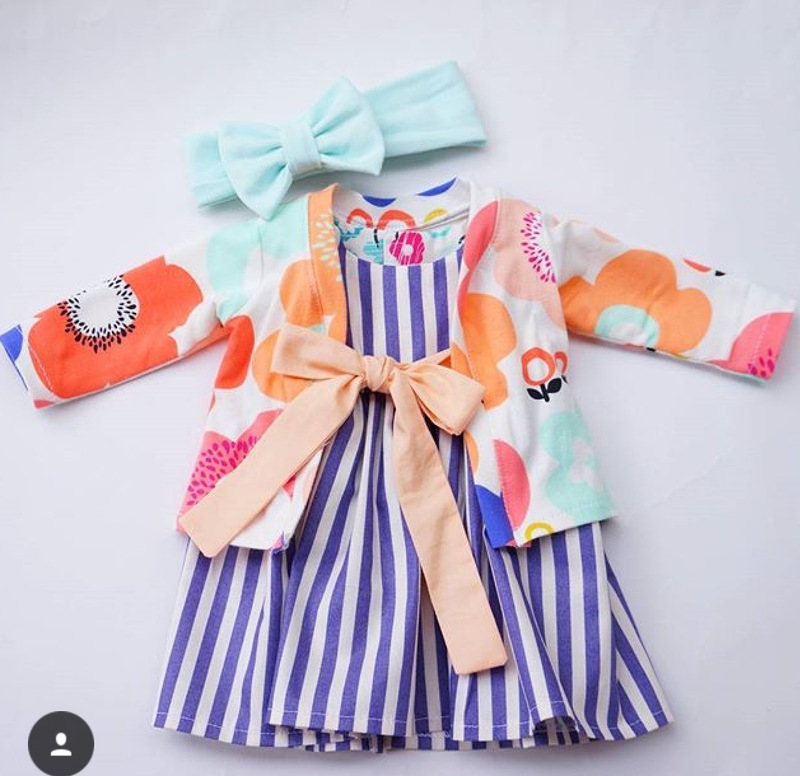 Ally Sews is the name of the business run by Alexandra, making some of the cutest modern dolls clothes I’ve ever seen! I bought a set of dresses myself for my daughters Christmas gift and I was thrilled with them – the quality, style and workmanship. 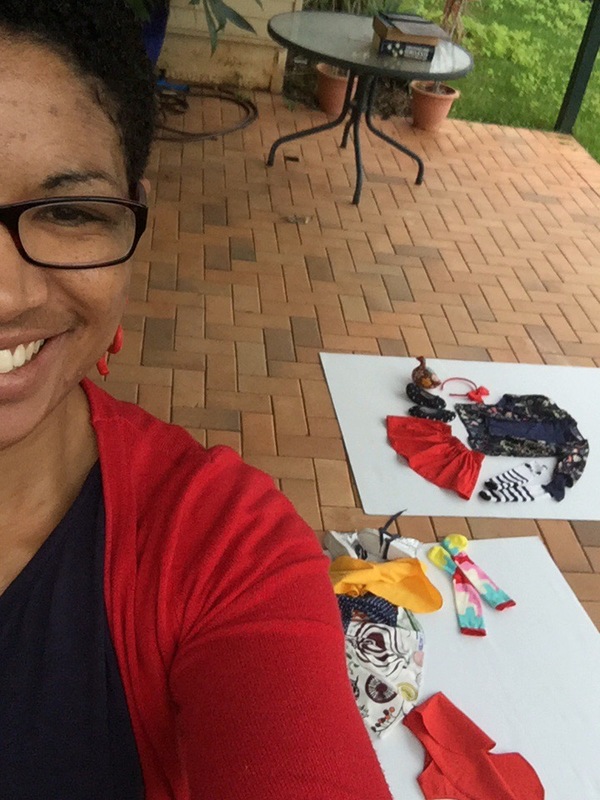 Read on to find out more about this talented young business woman! Alexandra,what are 5 things we might not know about you? 1. I try out every hobby there is. I’ve made jewelry, knitted, crocheted, embroidered, tried doll making…I need to stick to sewing!! 2. I’m a crazy Taylor swift fan. 3. I sew way too much. My eyes sometimes start to hurt ? 4. I have enough fabric to open a store. What is your inspiration, or what triggered this business idea for you? 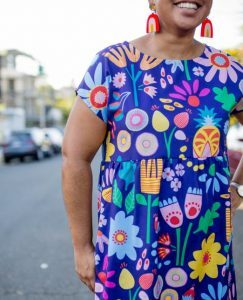 I love sewing, and was also a long-time etsy shopper, so I decided to see if I could open a shop and I did! ? My little brothers and sisters inspire me the most. What do you love most to do with your family/friends? I have lots of little brothers, sisters and nieces, I can use them as models and test new ideas on them. ? Get as much sewing done as I can and try not to get too distracted. (ahem…Instagram). What’s a goal for your business in 2016? So how many of you mums would love to pick out your perfect Mother’s Day gift? We all love those hand drawn, glitter covered crafts we get handed on Mother’s Day – but how cool would it be to also get an awesome gift handmade or handpicked by a small Australian mum run business? I’ve curated some of the best I’ve found for you to browse through, and many of them are offering Some very special savings – just for kablooie VIPs! What are you waiting for, get shopping!! To download your free copy , click here! I never realised how much I loved the world of doll houses and miniature things til I discovered Jennifer Macfarlane’s business – Whimsy Woods! Scrolling through Jennifer’s Instagram Feed is like an enchanted walk through a miniature world. 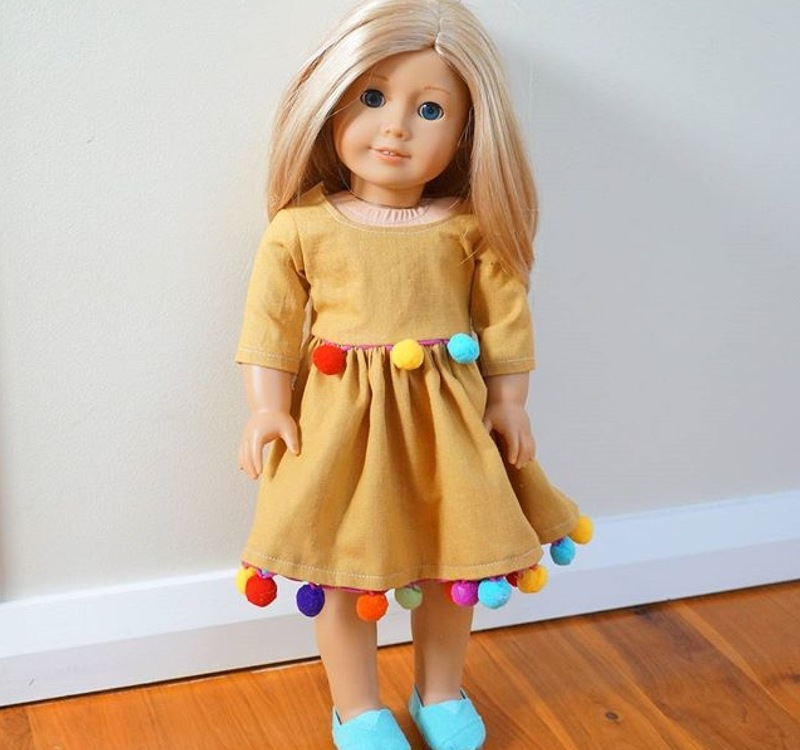 Jennifer is a busy and clever mumma who, in between caring for young kids and her busy life, manages to spend time completely renovating doll houses and their furniture and creating the most amazing on trend and personalised decor for it. Read on to find out more…. 1 Tell us 5 things about you that we might not know! – I am a Canadian Australian, I moved here 8 years ago in search of an endless summer. It’s way too cold in Canada! – I have been a Registered Nurse for 13 years. After having my daughter I decided I wanted to get away from the crazy stressful career and chase a bit of a creative dream. – I have two little ones. My son is 3 1/2 and my daughter is 1 1/2. They keep me very busy!!! We also have 2 dogs and three chickens!!! – All of my work is done after 7:30 pm or at nap times!!! One tired mum here!! 2 Tell us about your personal style…. My personal style is relaxed and beachy…. maybe it’s more like frumpy mum?!! You don’t catch me in heels and skirts very often! 3 How about household style? My household style is rustic, beachy and a hint of tropical. We live in a house that backs onto rainforest so our natural surroundings really inspired my interior decor. There’s a lot of natural and neutral in our house. 4 what is your inspiration, or what triggered Whimsy Woods? I started refinishing vintage furniture and had a plan to give things a whimsical twist for children’s rooms. I happened to have a doll house that I just quickly did up to sell (nothing special) and I had soo many people who wanted to buy it. I then did a second one and had people lined up for that one as well. So it all went from there. 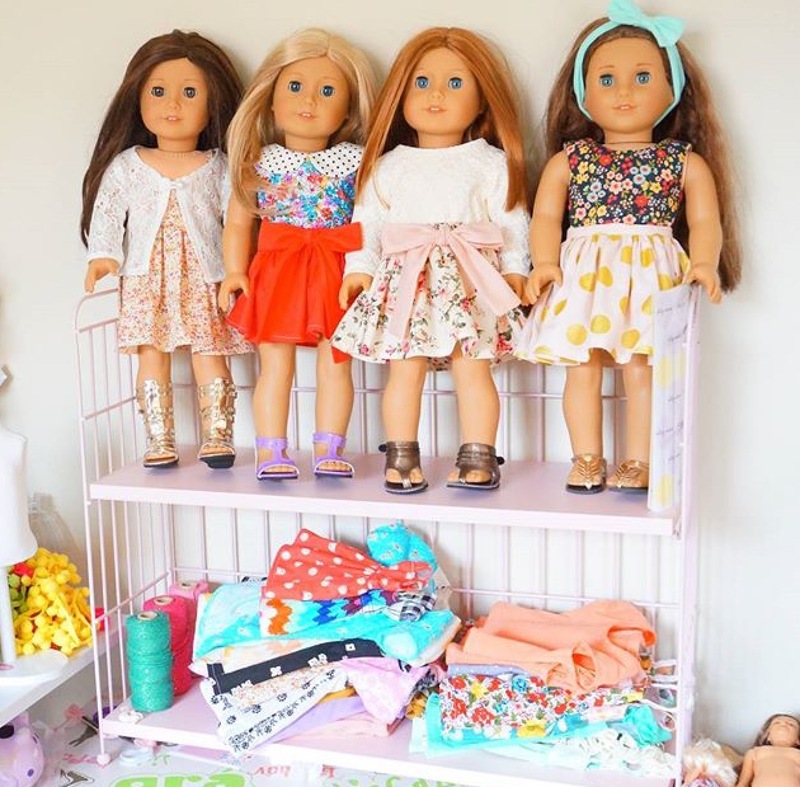 With each house, I ended up having so much encouragement and interest that I set my focus on developing a business plan around doll houses and decor. It was before doll house renovations became a massive thing! I didn’t even have Instagram at that point either. 5 What do you love most about what you do? I love creating something unique and special. Doll houses have a way of captivating the soul and they seem to be the one toy that little girls keep and pass on to their children. I love that I get to make these heirlooms very personal and each item I make reflects the little person I am making it for. I love everything about what I do! 6 What do you love to do with your kids? I love being crazy and wild with my kids! We love to dance and sing in the living room, go to the beach, scootering around, catching critters in the back yard, playing with our animals, star gazing, water fights and lots of cuddles. 7 What is your idea of an ideal day? An ideal day would be one where I get to shower in the morning before the screaming starts! lol ?? The kids both have a nap at the same time so I can squeeze in an hour of work!! Days that we’re all happy and having a good time. 8 what’s a goal for your business in 2016? My goal for this year is to continue to make really cute and special things and really get my name out there… I have so many awesome things in my head and I can’t wait to create them and show them to everyone. 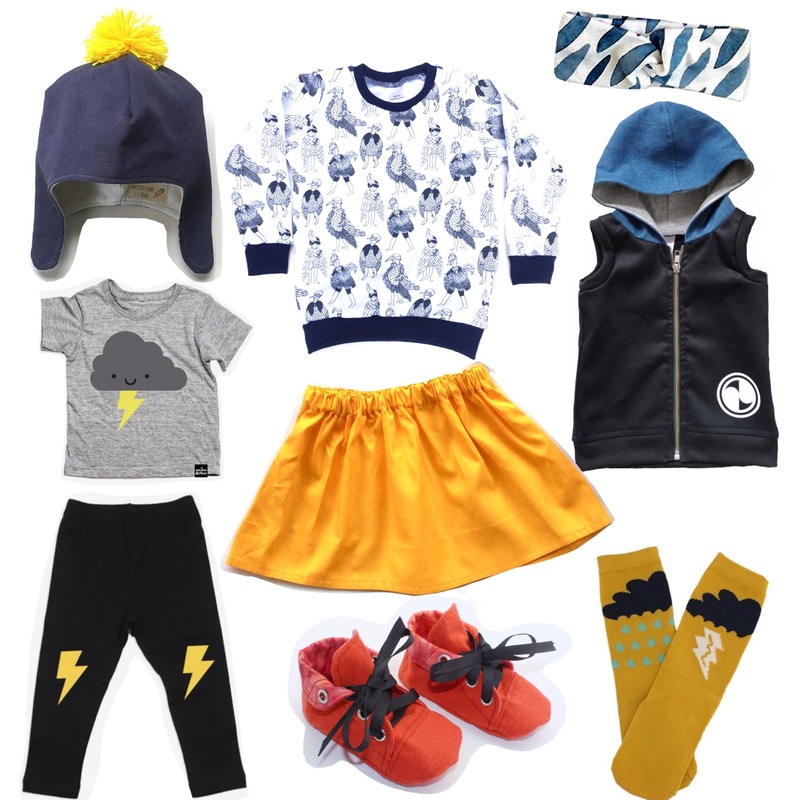 I am branching into boys items next and I have so many cool ideas for this. I also have some exciting collaborations coming to the table this year. 9 Where can we find you? 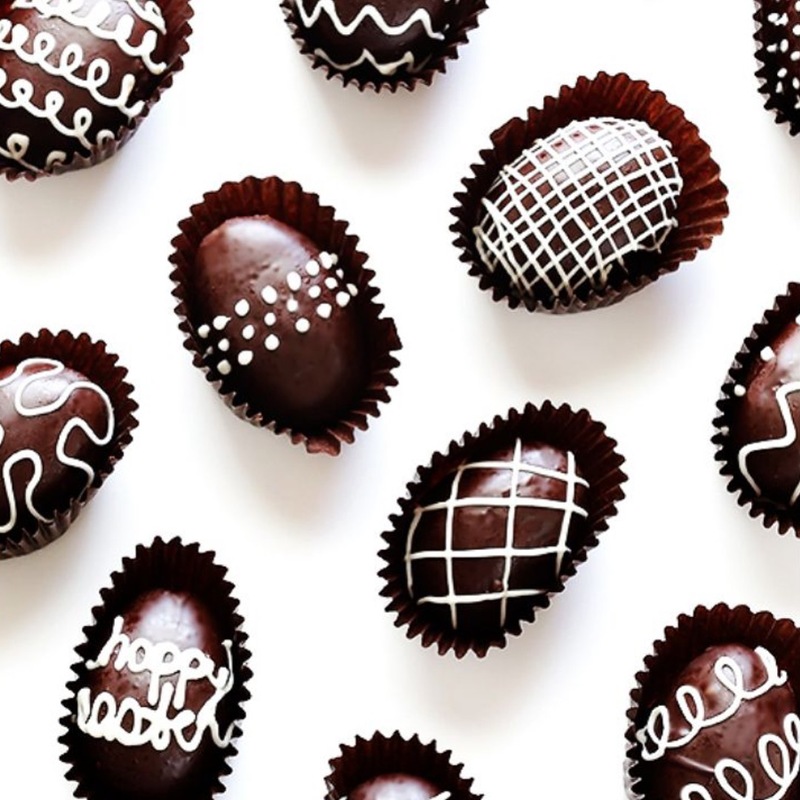 In March I released an Easter Gift guide, with all sorts of handmade and shop small (and non chocolate!) goodies from makers and business owners across Australia. If you’d like to be subscribed to future gift guides and newsletters and get hem straight to your inbox, just click this link ?? http://www.kablooiestore.com/mobile/page/subscribe ! Bought Kablooie? Loved it? Leave a review. Love early access and launch alerts? Become a Kablooie VIP!